Well, this month 2 years ago I officially received a paycheck from DC Comics for a little web comic I helped create with my good buddy, Brock Heasley. Boy, those were the days. It was incredibly exciting for the both of us and a few months later it became quickly heart-breaking. I’ll give you the cliff notes version of what I’m talking about. 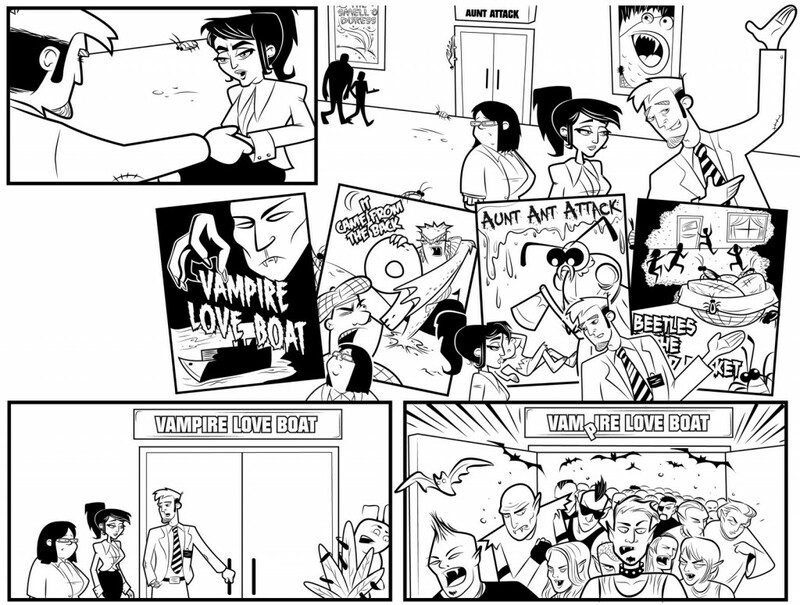 For those of you who didn’t know, Brock and myself entered a web comic contest back in February 2010 on a site called Zuda.com. Zuda was an imprint of DC Comics. 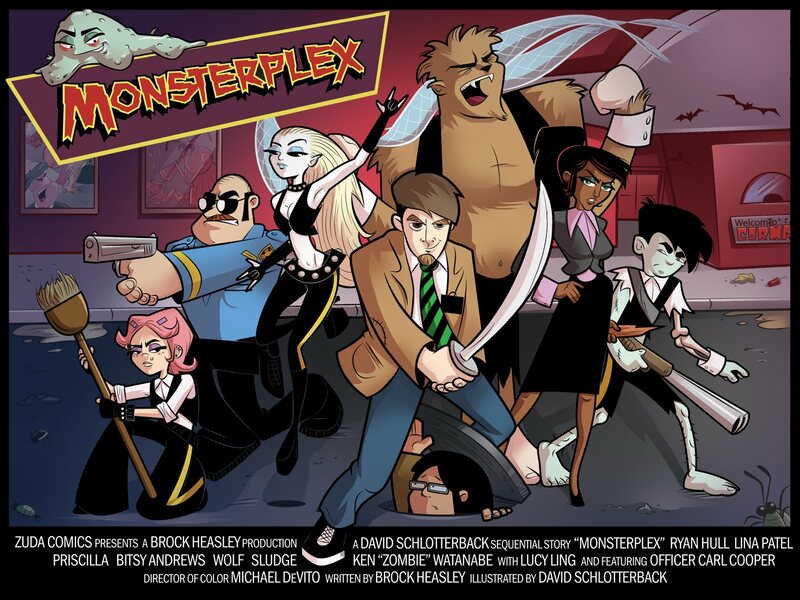 We won the contest against 9 other web comics submitted and consequently received a 1 year contract to develop the web comic, Monsterplex, for Zuda/DC and in return we would receive money and fame. Well, at least money. However, a few months later DC dropped Zuda and 95% of all the web comics that were a part of the imprint. Let us all cry in unison now. Bwhhaaahaha!! But, it didn’t end all bad. DC bought out our contract to make us go away quietly AND we got to go to San Diego Comic Con for three years for free. Cool, huh. 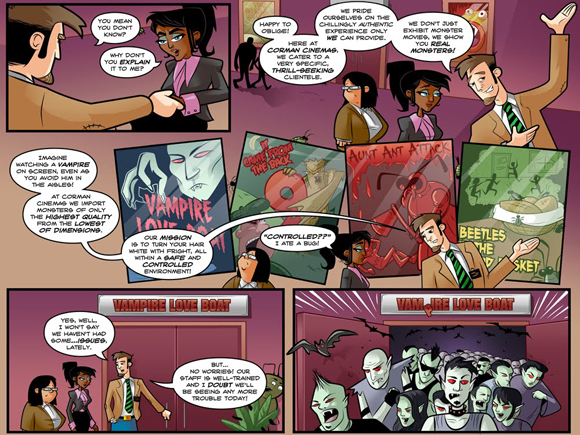 So, in light of the two year anniversary of my first and only professional comic creating gig, I thought I would swipe an entry from our Monsterplex blog that we used to promote the comic during the contest. 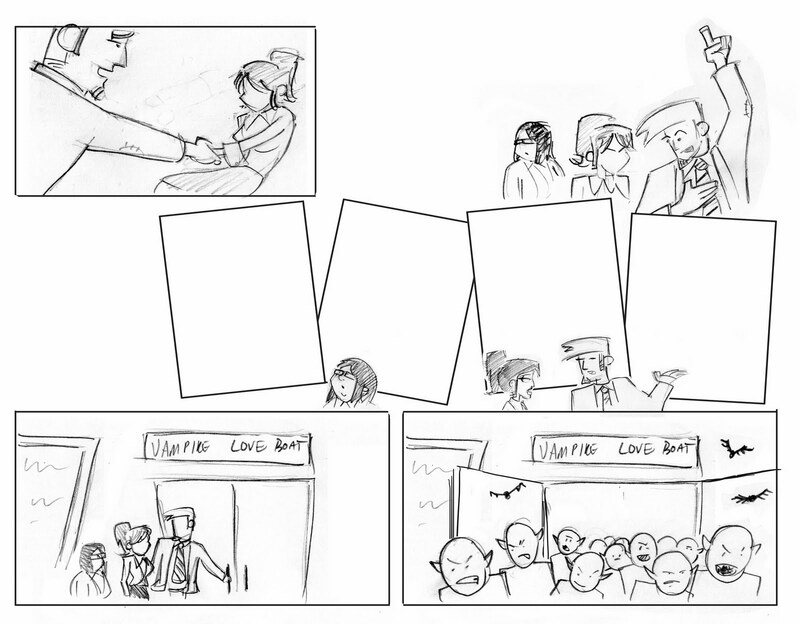 This one is showing how we create a page for the comic going from the script to the final page. Brock originally came up with the concept of Monsterplex and he was also the script writer. We both developed the characters and I actually got to contribute some plot ideas that Brock was happy to incorporate. But, my main job was to do the artwork and the layout of the comic. We then enlisted an ally of Brock’s named Mike Devito to do the colors. Now the idea here is to take his script and draw a comic around it. Sounds easy, I know and I thought it surely was. However, it proved more difficult than I imagined, in large part because I was a complete novice to the comic-thing. I don’t really even read comics anymore let alone analyze how they are put together. So, Brock and I would go back and forth often until his vision of the script was realized. 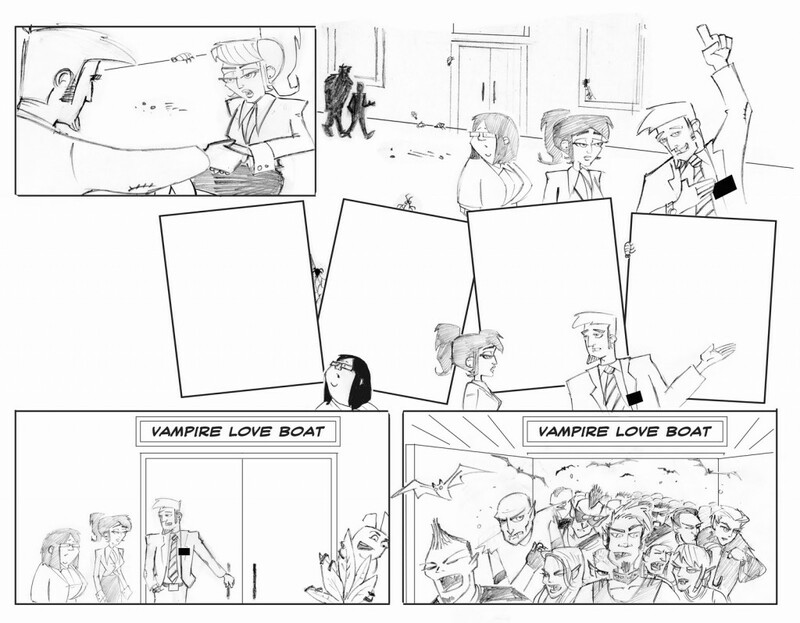 So with that in mind check out the process of pencils to ink. First attempt. 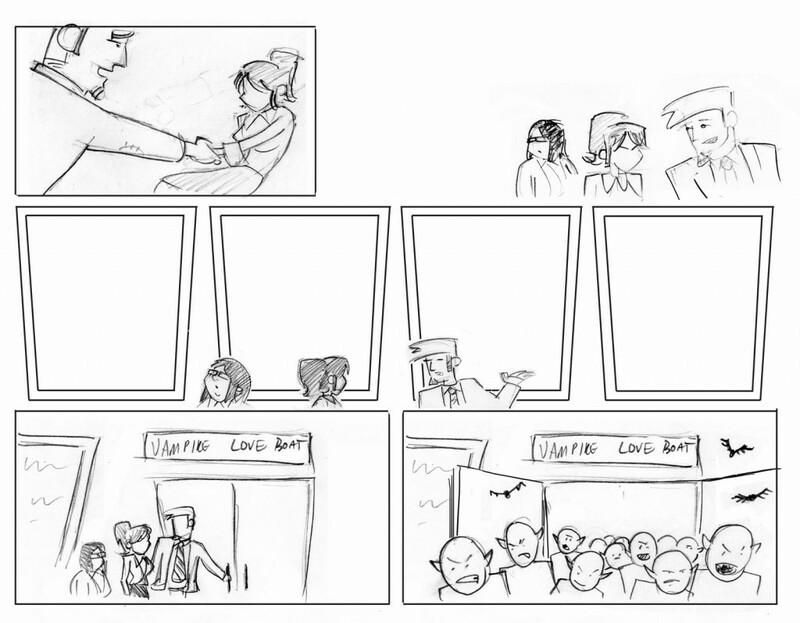 The page was lacking something and Brock felt it was the posters that the trio were walking past. So, back to the drawing board..
2nd attempt. That did it. Just putting the posters slightly askew made it feel more like the trio was walking in an abstract space instead of past a boring wall. It gave Ryan's monologue kind of a "montage feel." Refinement. I'll let Brock boast of my approach: "Here Dave is fleshing out his layout. It always amazes me how rough his pencils are in light of how exacting the inks are." Inked Version. Now to be sent to the colorist - Mike Devito. That’s it. Easy, huh? Well, it was definitely a fun run for me. So, I’m sure you’re asking yourself “Whatever became of this awesomely talented trio of boys?”. Thanks for the compliment and allow me to retort. Brock has another web comic that he has been doing long before Monsterplex came around called Superfogeys. Check it out, it’s quite good. He also has just finished a memoir … yes a real book not a comic. As you can see, Brock has got a little bit of talent in him. Mike Devito is the founder of Th3rd World Studios which hosts some great web comics, including Superfogeys. I, David Schlotterback, am currently writing this blog. Oh and I run a little company called California Dingo. I also collect rubber duckies and love to watch paint dry. Thanks for checking out today’s post and tip-toeing down memory lane for little ol’ me. I’m much obliged. ← What Is Mastering, Anyhow?